Housekeeping puts us all off — I know it does me, especially marketing housekeeping. 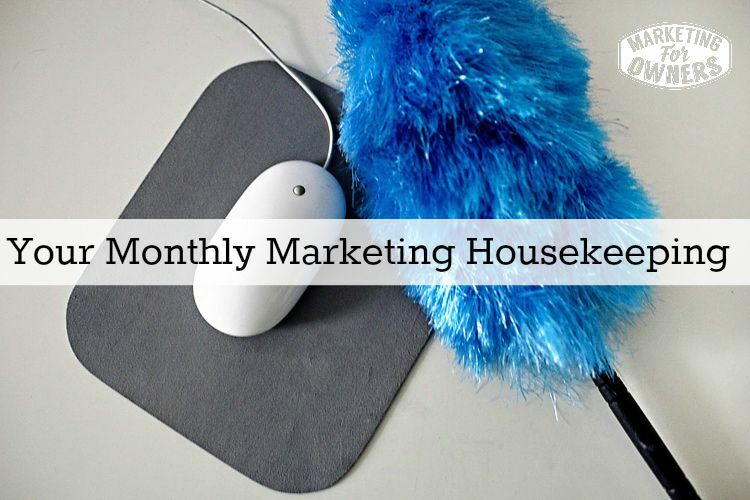 In fact, you’ve probably never even heard of marketing housekeeping. I haven’t. I just made it up. However, it’s something we need to do. It’s something we need to do every month because remember, we’re always going to be marketing. As I’ve explained before, marketing covers everything in your business except taking the money and giving them the goods. In fact, I should cover giving them the goods and not just taking the money. Everything else. Anyway, this is going to form your weekend challenge and you know how I like a weekend challenge. So, let’s start. Get your pad, get a pen, or you can use a pencil. We need to review what I call remote customer touch points. Now a lot of us have businesses, especially my fire protection business. We are an e-Commerce business, we’ve got warehouse, we deal with customers on the phone. We don’t see customers. We rarely meet them. We don’t have any sales people, we don’t have any outgoing staff, even delivery staff of our own. So, remote customer touch points would be your telephone greeting, your paperwork, yes and your packaging. Paperwork when I mention that, is everything from a letterhead to a business card to your invoices. What we’re looking for here is consistency of your brand and the same with your telephone greeting, consistency of the brand and message. In addition, packaging consistency of the brand and message. Have you conveyed your marketing theories to all of your staff? That includes temporary staff. That includes people you wouldn’t imagine such as perhaps your cleaner or your apprentice or your interns. You have to tell everybody no matter how short a time they’re going to be there. Have you conveyed it to them since you had a meeting with everyone else? There are two ways of greeting your customers; one is in-house and that would include any visitors including reps because you never know who may become a customer or who may be wanting to recommend you. Be nice to everyone. So, greeting you customer or visitors in-house. But also for all of your staff to greet customers or potential customers or anyone else out of house. So, in other words, at their premises or at a meeting or at a conference or at a networking event. You need a consistent message that is concurrent with your brand. Make sure that everyone knows what to say, how to say it, how you want it to be said and make sure it’s consistent. That include delivery drivers, that includes whoever answers the door,and not just the person whose going to meet them. Once you have these things in place and once you review them, you’ll find things are becoming natural, it becomes in-built. Everyone hears it. It comes consistent. Referrals are the lifeblood of the perpetual sales cycle. Once you get your sale from your customer, you’ve put all that effort into getting them, you want to put some effort into making sure they come back for more. Then that they think you are so wonderful that they tell everyone else that they should buy from you too then they become a preacher and then it perpetuates. So, figure out how you are going to ask for referrals. Now, awhile ago, episode 92 to 96, I looked it up, I did a whole weekly series on how to get referrals. Some of these things are just the easiest, you would not believe it. So, if you can’t remember, go back. They’re only five minutes. Go back, listen to those. Get those referrals, okay? The final is your elevator speech. Personally, I hate the term elevator speech. One, because in the UK, we have lifts and our lifts are quite often only like one or two floors high so you’ll be down in a few seconds. But it’s your introduction. What does your company do, what do you do? Get that message straight. What solution do you provide? What problems do you solve? It’s not we are some cheap metal company. What solutions do you provide for what type of customers and what results do you give? These are the things I’d like you to work on this weekend. Tidy them all up, review them. They may be lovely and they may be perfect. But as long as you’ve gone through them you can be pleased with yourself. You can reach over, give yourself the old virtual pat on the back, job well done. So, that’s your weekend challenge. Otherwise, have a good one, and I’ll catch you on Monday. Are you starting on your weekend challenge?